The dental disease model is based on a lifelike illustration of a lower jaw with 16 removable teeth of an adult magnified two times. One half of the dental-disease model shows eight healthy teeth and healthy gums. 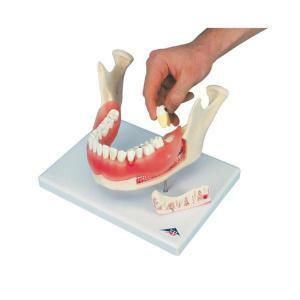 The other half of the model shows the following dental diseases: dental plaque, dental calculus (tartar), periodontitis, inflammation of the root, fissure, and approximal and smooth-surface caries. One part of the front bone section can be removed from the dental disease model to view the roots, vessels, and nerves. Two molars are sectioned along the length to show the inside of the tooth. The model is delivered on a base.